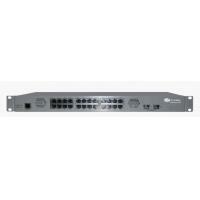 OnAccess 7424M-FX Managed Fiber Optic Ethernet Switch is a high-performance managed Layer 2+ switch for service providers. It offers up to twenty-four 100Mbps Fast Ethernet fiber optic ports, as well as two Gigabit Ethernet fiber optic ports and two 10/100/1000M RJ45 copper ports. OnAccess7424M-FX is targeted at the emerging market of Ethernet based FTTx. It comes with a rich feature set to meet the requirements of a variety of applications, especially those of the access network or the small-to-medium-scale customized network. The feature of dual power supply provides power redundancy for applications requiring high reliability. OnAccess7424M-FX is low-profile with a standard rack-mount size. It achieves the highest fiber port density within a single rack, providing users with the best performance/price ratio. The network management function on OnAccess7424M-FX allows administrators to easily configure features, monitor performance and troubleshoot the switches using a standard RS-232 port, Web browser, Command Line Interface (CLI) or Simple Network Management Protocol (SNMP)-based network management platform. Main applications include FTTx, fiber optic LAN, industrial Ethernet, Ethernet based DCS and digital video surveillance system. 8K address table for auto-learned unicast addresses. Jumbo frame supports up to 2048 bytes. 802.1p and Port based QoS package classification with 4 priority queues. 13 trunk groups of up to 8 member ports for flexible load distribution control and fail-over function. 802.1d Spanning Tree Protocol, 802.1w Rapid Spanning Tree Protocol. Dual multimode fiber(50/125μm), single wavelength 850nm, dual LC connector, 550m reach. Dual multimode fiber(62.5/125μm), single wavelength 850nm, dual LC connector,275m reach. Dual single-mode fiber, single wavelength 1310nm or 1550nm, dual LC connector,15/40 km reach. Single single-mode fiber, dual wavelength 1550nm/1310nm, SC/PC connector, 15/40 km reach. Dual single-mode fiber, single wavelength 1310nm or 1550nm, dual SC connector, 15/40/60 km reach. Dual multimode fiber, single wavelength 1310nm, dual SC connector,2 km reach. Dimensions: 19-inch rack-mount width, 1.0U height. Humidity: 5% ~ 95% RH Non-condensing. SFP1000SX: Dual multimode fiber SFP module, 275/550m reach.